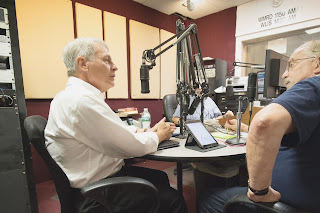 MIDDLETOWN - Sen. Len Suzio (left) discusses the state budget with WLIS/WMRD host Phil Mikan (right) during Suzio’s July 12 appearance on the “Phil Mikan Show”. Sen. Suzio is inviting taxpayers to his Town Hall Meetings on Tuesday, July 25 at 7 p.m. at the Middletown Council Chambers and on Thursday, July 27 at 7 p.m. at the Middlefield Community Center. Sen. Suzio and the Connecticut Senate Republicans have proposed a state budget solution which can be viewed in detail at www.NewDirectionCT.com that does not raise taxes while protecting funding for towns, local education, and services for Connecticut’s most vulnerable residents. The Democrat Speaker of the House and the Democrat Senate President Pro Tempore must sign an Emergency Certification in order for a bill to be debated and voted upon in Special Session. Without those signatures, Sen. Suzio noted that Republicans are blocked from even making the public argument in favor of their thoughtful budget solution. He urged WLIS/WMRD listeners to call their state legislators and to urge them to allow a debate and a vote on the Senate Republican Budget. House Democrats can be reached at 860 240-8500. Senate Democrats can be reached at 860 240-8600. Sen. Suzio (www.SenatorSuzio.com) represents Cheshire, Meriden, Middlefield, Middletown and Rockfall. He can be contacted at Len.Suzio@cga.ct.gov and 800-842-1421.